Looking back at 2010, I had the privilege to be able to make oversea trips to China to learn more (buy more also) about Chinese tea. The tea markets in Guangzhou was a real eye opener and is a worthwhile visit for a Chinese tea drinker or collector. I am visiting Guangzhou again during this Christmas week. A few readers have asked me the travel aspects of my past trips to Guangzhou, Hong Kong and Kunming. They had requested information on hotel, dining and shopping besides tea. 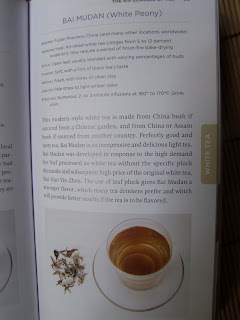 I will include such information in my subsequent blogs when I go overseas to learn (and buy) Chinese tea. Hotel stays for me is about 3 stars (sometimes the internet gives real deep discounts on good hotels)……as long as its clean, safe, has internet and has a hot shower. I do not use the hotel’s facilities as I tend to be out from 8am to 8pm (earliest). I eat regular local food fare but will look out for those preferred or rated eats by the locals there. I might give myself a hotel buffet on my last night there. Travel guides (Frommer or Lonely planet) and internet searches do provide some guide on good hotel rates, dining and subway maps. Most importantly, make all hotel bookings online and you can get the best rates. Back to tea. I had drank lots of ripe pu erh this year and the Haiwan 06 mavin and the Fuhai 07 large leaf pu erh were the highlights of my 2010 ripe teas which I had opened from my collection. These 2 teas were highly aromatic and tasty as well. Highly recommended. I did not drink much raw pu erh this year as my raw pu collection are relatively new teas (less than 5 years). I have recently acquired a couple of older raw pu erh and I hope to opened them in 2011. The above pix shows a 2003 Haiwan and 2001 Menghai raw pu erh (both had been stored in Singapore for more than 6 years). For oolongs that I drank this year, the traditional “Sea Dyke” and Wuyi Shuixian, both Fujian oolongs packed in nifty tea tins were, to me, good quality traditional shui xian in terms of robustness, fragrance and taste. These oolong teas are very inexpensive and I have been happily brewing these oolongs a couple of times a week. Happy Holidays and I hope everyone will have more time for tea. Printed this year by Crown Publishing, 'The Tea Enthusiast's Handbook' is written by Mary Lou Heiss and Robert J. Heiss. A look at the the back of the book (click pix for enlarged views) revealed that the authors are also tea retailers for their shop 'Tea Trekker' in the States. I found the book very informative and the many photo illustrations make this book an extremely readable one. I found, that the authors took many pictures of the various teas and also the various colors of these tea brews, which makes the reading very pleasant and it was easy to relate and understand the tea information presented by the authors. The book deals with purchasing tea, steeping the perfect cup and the 6 classes of tea (green, yellow, white, oolong, black and pu erh tea). The authors, in their selection of teas, do provide detailed information of each type of tea and recommend the steeping times for brewing these teas. 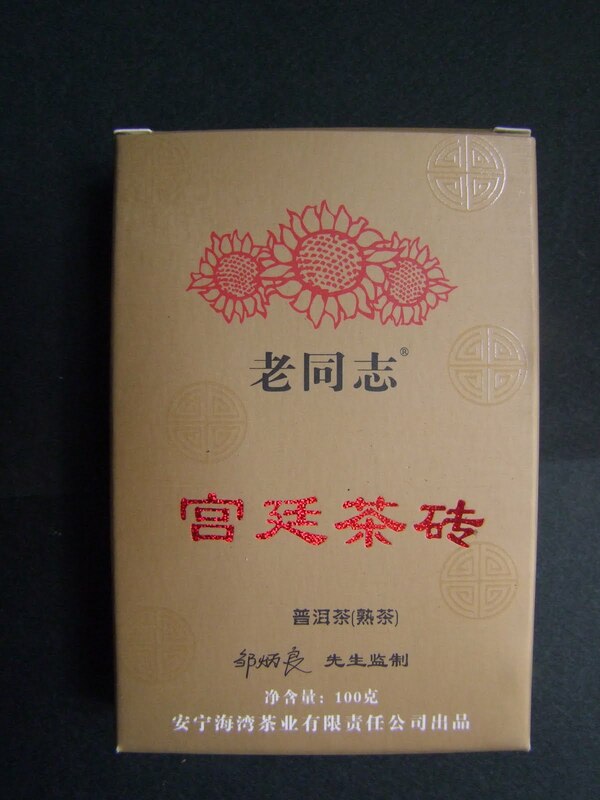 Shou Pu-erh is made in tea factories using the wo dui process. Wo dui begins by spreading the mao cha in a deep pile on the factory floor, and the leaf is dampened with mists of water. After the proper dampening, a thermal blanket is put over the pile of leaf. Heat builds up in the pile, encouraging both oxidation of the leaf and fermentation as enzymatic changes start to occcur within the leaf. This heat buildup encourages the viability of the natural bacteria present on the leaf, stimulating and initiating the fermentation process. The pile is turned every day or so a to allow each leaf to spend some time in different layers of the pile. When we visited the Menghai Tea factory, we were told that their wo dui process takes sixty to seventy days to complete. After wo dui is completed, the leaf is dried to a moisture level of approximately 10 percent. After this stage, the leaf is compressed and shaped in a hydraulic machine. The tea cakes are then put in a drying room where they will rest and continue to dry on racks before being wrapped." a) it is a normal practice for a tea cake to have nicer or bigger leaves on the outside of the cake and have the 'not so nice' leaves on the inside of the cake. My discovery of this phenomena was highlighted in my 13 nov'09 blog when I found out that the leaves inside a 2000 ripe brick looked different from the leaves that were on the surface of the brick. I suppose it makes economic and marketing sense......in that you can't expect perfect leaves in every production. Sure you will get tea leaves of different sizes not to mention some broken or torn leaves. My recommendation is that you break up a cake totally and and place the pieces in a tea caddy, That way, a brewing of this tea will be more representative of the tea than just peeling bits and pieces of the cake. b) the authors seem to suggest that the fermentation of ripe pu erh is natural in that the tea factories do not add any enzymes or fermenting bacteria into the fermentation process. Ripe puerh achieved a super fast fermentation process than raw pu erh due to to the added moisture and heat(thermal blankets). I enjoy reading "The Tea Enthusiast's Handbook". 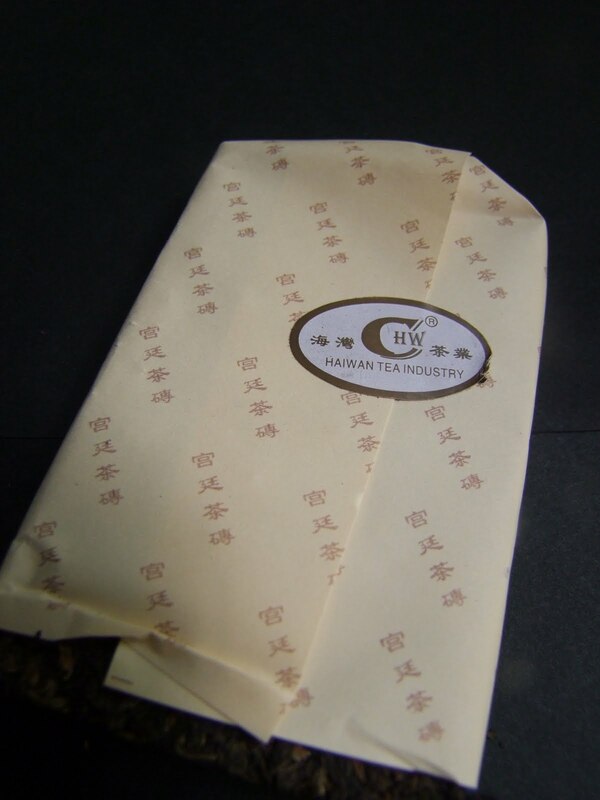 This 100g ripe tea brick is produced by Haiwan in 2006. 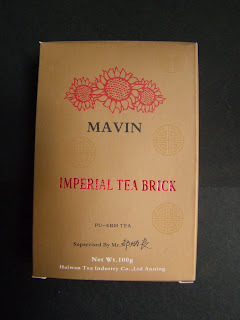 I am a fan of Haiwan tea and this "Imperial tea brick" strengthens my admiration for Haiwan tea products. This 2006 tea brick comes packaged in a nice presentation box. You will have noticed that the 'English' side of the box had the "Mavin" imprinted on the box. I had the impression that "Mavin" was used to represent the chinese words "Lao Tong Zhi" used by Haiwan. I believe this translation was abandoned as it was not used in later Haiwan products. Before I forget, use less leaves and do a quick brew, at least for the 1st three infusions. Quick brew here means - pour boiling water in teapot, cover the lid, and serve....no waiting time. This tea brews fast and strong. The aroma of the brewed tea is "WOW". There is a deep toasty, herbly and earthy scent. Compared to the various ripe teas I have drunk (see a few of my previous blogs), the aromatic index of this tea has been turned up a few notches. Taste is nice and smooth with no bitterness. I could get only 7 drinking infusions from one brew. For those who like ripe pu erh like me, do consider getting a brick of this Haiwan tea. 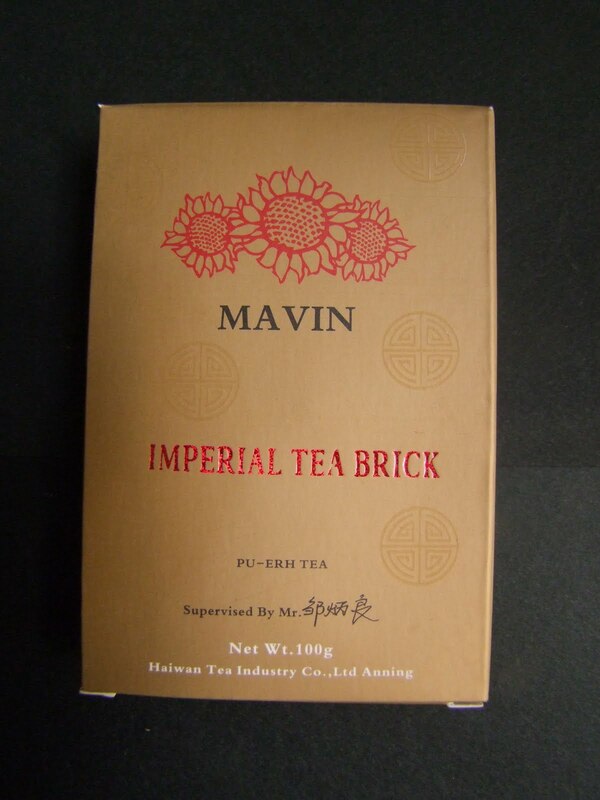 This 100g brick is also ideal when you order from tea dealers online, especially when you need to fill up your order to round up to the nearest kilogram or pound without incurring additional postage. A local food critic in Singapore used the following phrase when he wants his viewers to try a dish, and I will likewise use this phrase to summarize my thoughts on this tea - "Die, Die Must Try."